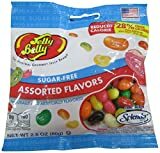 Have Jelly Belly beans without the sugar. Our sugar-free formula has 28% fewer calories than regular beans. Included are ten of our most popular flavors: 2.1 lb case. To preserve freshness, 2.1 lb cases will be packed as 12 individually-sealed 2.8 oz bags. WARNING: Consumption may cause stomach discomfort and/or a laxative effect. Individual tolerance will vary; we suggest starting with 8 beans or less. All sugar-free jelly beans by Jelly Belly are certified OU Kosher by the Orthodox Union.